If you've found what your looking for follow the easy steps below. Telephone 07855 464667 or email (click here) our shop with your order and delivery details. You will receive an email with a link to pay online via PayPal. Knowing what hive to choose can be a difficult choice. 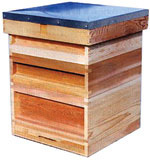 We have various hives available for all budgets. 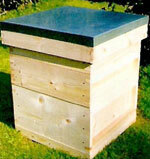 If you would like advice on the best hive for you please contact us. 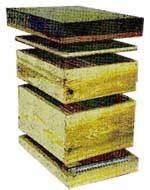 This is the British Standard National Hive but made in deal instead of the increasingly expensive Western Red Cedar. British Standard Specifications are followed for all measurements but much cheaper redwood is used for the hive parts, including the 4" deep roof which is ventilated and metal covered to keep the bees as warm and dry in winter as they would be in a hive made from traditional cedar. The National Economy Hive will accommodate the same BS frames and foundation, queen excluder and other internal parts but retails at an amazingly low price. 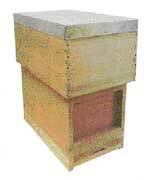 This hive is 18 1/8" square taking 11 British Standard frames. Designed and approved by the Ministry of Agriculture. External parts in Western Red Cedar. Comprising floor, brood chamber taking 5 frames, cover board and deep roof to accommodate a feeder. 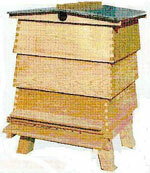 The Langstroth hive is the standard hive used in many parts of the world and was invented by Reverend Lorenzo Lorraine Langstroth in 1851. It is used by many beekeepers because of it’s larger brood body, ease of handling, simplicity of design and ready availability of commercial uncapping and extraction equipment.